On Easter Monday, 28 March 2016, Ballea Park will play host to a exhibition match between Republic of Ireland Masters and Cork City Masters. 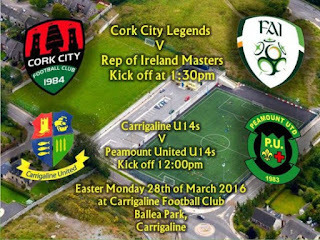 The Masters match kicks off at 1.30 p.m. and will be proceeded by the U14 clash between Carrigaline United and Peamount United of Dublin. There will be lots of fun on the day for all ages, with beverages - warm and cold - available from the bar. Tickets will go on sale early next week, with proceeds generated being retained by CUAFC to support our football activities. Further details, including the make up of the Masters squads, will be available shortly.